Harold Grad was Professor of Mathematics at New York University (1948-1986). His research interests included kinetic theory and statistical mechanics. January 14, 1923Birth, New York (N.Y.). 1943Obtained BEE, Cooper Union, New York (N.Y.). 1945Obtained MS, New York University, New York (N.Y.). 1948Obtained PhD in Applied Mathematics, New York University, New York (N.Y.). 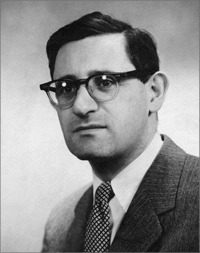 1948 – 1986Associate Professor (1948-1957); Director, Magneto-Fluid Dynamics Division (1956-1980); and Professor of Mathematics (1957-1986), Courant Institute of Mathematical Sciences, New York University, New York (N.Y.). 1964 – 1967Member, Advisory Committee for Fusion Energy, Oak Ridge National Laboratory. 1974 – 1977Member, Advisory Committee for Fusion Energy, Oak Ridge National Laboratory. 1986Awarded James Clerk Maxwell Prize for Plasma Physics, American Physical Society. PhD advisor at New York University on the kinetic theory of rarefied gases and both employed at New York University. Both employed at New York University. Obtained MS (1945) and PhD in Applied Mathematics (1948). Associate Professor; Director, Magneto-Fluid Dynamics Division; and Professor of Mathematics. Receive 1986 James Clerk Maxwell Prize for Plasma Physics. Member, Advisory Committee for Fusion Energy. Harold Grad Physics Today obituary.